Our dashboard mount has all the qualities you're looking for: lightweight, portable and adjustable. The bracket is jointed, allowing you to position your device for the best view. 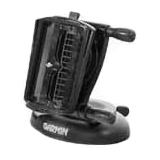 Includes temporary and permanent adhesive disks that adhere the mount base to the dashboard.